We have four different types of Spectrum Noir graphic markers to choose from: the original Colouring System, Illustrator markers, ArtLiners and the Sparkle Glitter range. Read on for our overview of each of these, and find out about our exclusive competition to win your very own collection of Spectrum Noir markers worth over £100! 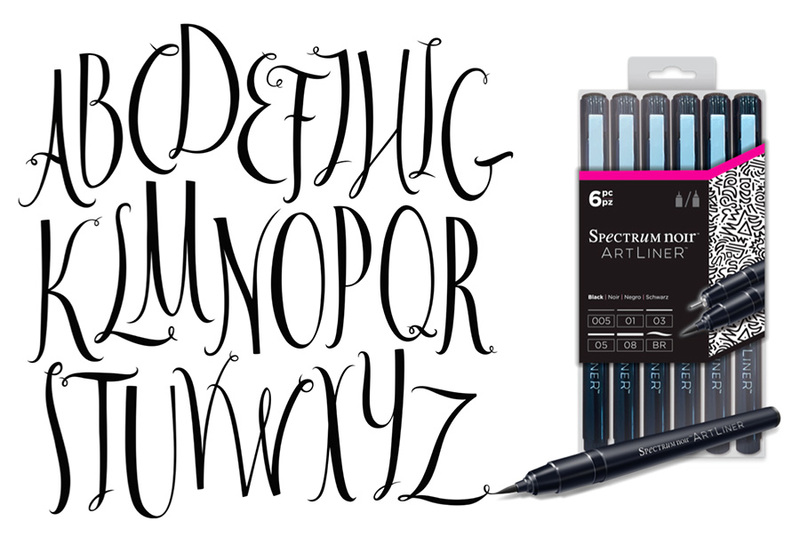 The original Spectrum Noir Marker introduces you to the super-smooth coverage and blending ability of alcohol markers. With the unique Colouring System, you’ll soon learn the basics of blending and be colouring like an expert before you know it! 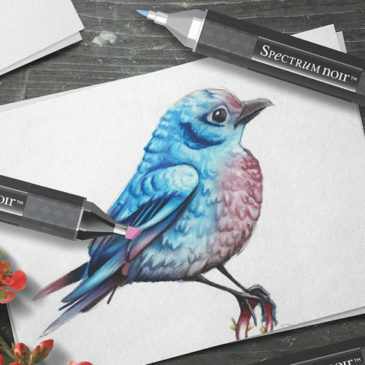 The quality colour dyes used in all Spectrum Noir markers will give you perfect, even coverage every time – their translucent effect means they can be overlaid and blended on paper to create beautiful, realistic shades and tones. Also, because the inks are alcohol-based, they dry quickly and can be used on a wide variety of surfaces including paper, card, wood, textiles, plastic, metal and many more. Each Colouring System Marker has two nibs, a broad chisel nib for covering large areas and a fine bullet nib for filling in the smaller details. The full alcohol marker range is made up of 216 colours, and to help you navigate your way around such a large selection the Spectrum Noir Colouring System groups every colour for you by hue & intensity, and then numbers each from light to dark so that you can effortlessly achieve smooth, even blends of colour. Like colours of the same strength will always blend perfectly, so all you need to do is pick a group and then follow the numbers to create realistic depth and shade. All of the colours are conveniently organised into ready-made sets, so you can buy the ones that go together. It couldn’t be simpler! 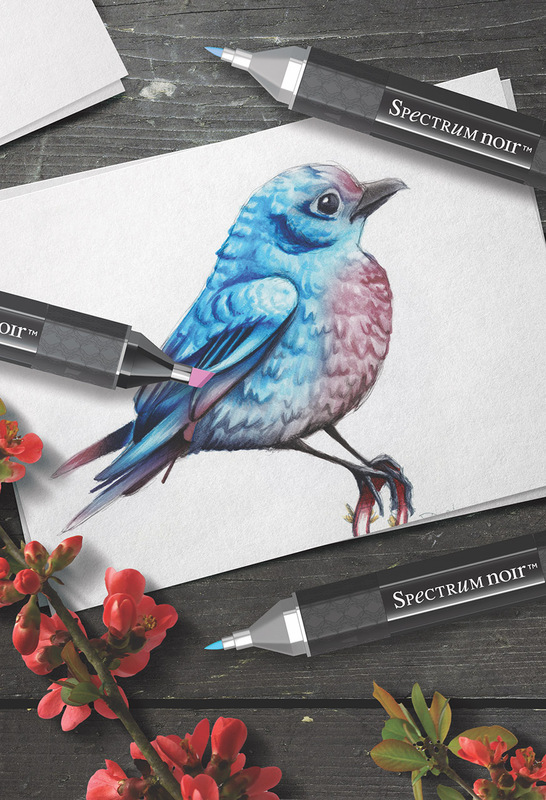 Illustrator is Spectrum Noir’s professional dual-tipped marker for sketching, drawing and illustration – perfect for when you want a more natural, artistic style. Illustrator’s alcohol based inks have been carefully formulated using high-grade artist’s quality dyes, to offer unbeatably smooth colour laydown with just the right translucency for seamless blending. Each pen features a super-fine nib for detailing, combined with a flexible brush for smooth and natural line work. Illustrator has been made with the more serious, regular user in mind, and is built to last with around 25% more ink than the standard alcohol marker. Its ergonomic barrel has been designed for comfortable extended use, supporting a range of grip and stroke styles. 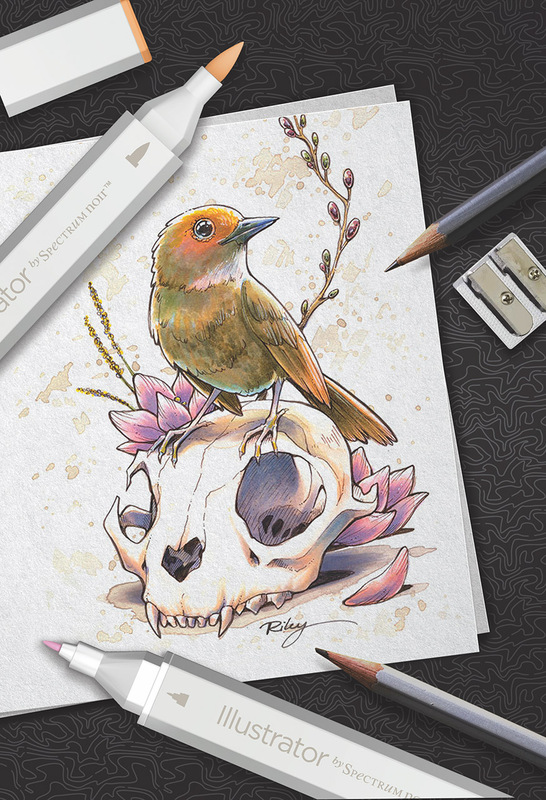 It’s ideal for every situation, whether it’s some light sketching, or a more highly finished illustration. Illustrator markers share the same space as other alcohol-based markers from Spectrum Noir, so it’s easy to switch between them. Illustrator colours can be bought in convenient sets organised according to popular artistic colour themes. ArtLiner is a range of fine line pens for sketching, outlining and colouring fine detail. They come in various colours and line widths, along with a fine brush point that’s perfect for creating beautiful hand-drawn lettering. Each ArtLiner pen is filled with high quality ink that’s been specially sourced from Japan, resulting in a silky smooth feel, with even coverage and pin-sharp accuracy wherever you need it. ArtLiners are completely smudge proof with alcohol ink, so will give you perfectly crisp, detailed outlines when illustrating with markers, whilst their artist’s grade micro-pigments ensure outstanding light-fastness, for colour that won’t fade. They come in black and neutral tones that are ideal for outlining and shading, as well as a small selection of primary and secondary colours. ArtLiners come in 0.05, 0.1, 0.3, 0.5 and 0.8 mm line widths, along with a brush point in a selection of colours and sets. Perfect for adding a touch of glamour to art and craft projects, the Sparkle Glitter pens are filled with vibrant water-soluble colour that contains a special fine glitter pigment. The result is a shimmering sparkle effect that will bring a dazzling new dimension to all your art and craft projects. There’s even a clear overlay pen, containing just glitter pigment that can be laid over any colour – so the possibilities are endless! To get the best from your Sparkle pens, just break the seal then give them a shake. The pen’s flexible brush will give you a smooth, accurate and mess-free application, whether you’ll colouring over a large area or working on something more detailed. 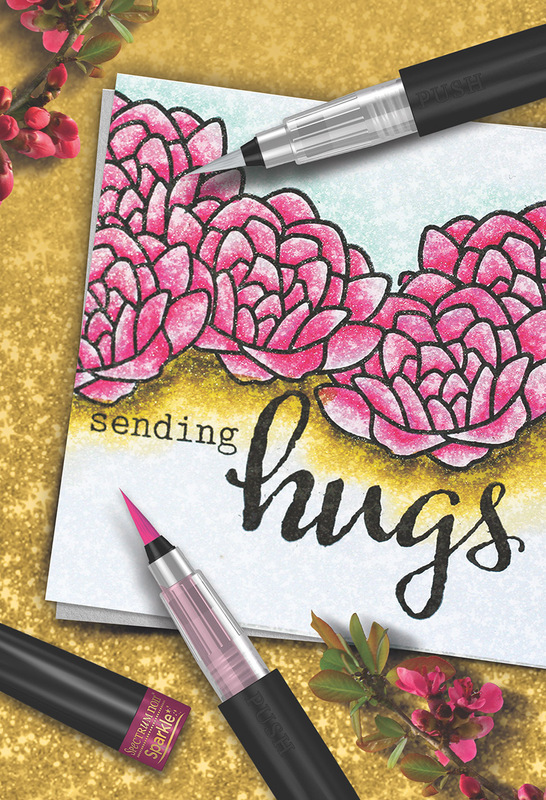 They’re perfect for colouring, writing, embellishing, accenting and more besides. Sparkle Glitter pens are available in a choice of seasonal colour-themed 3 pen sets or in a special 12 pen set, presented in an attractive carry-case. 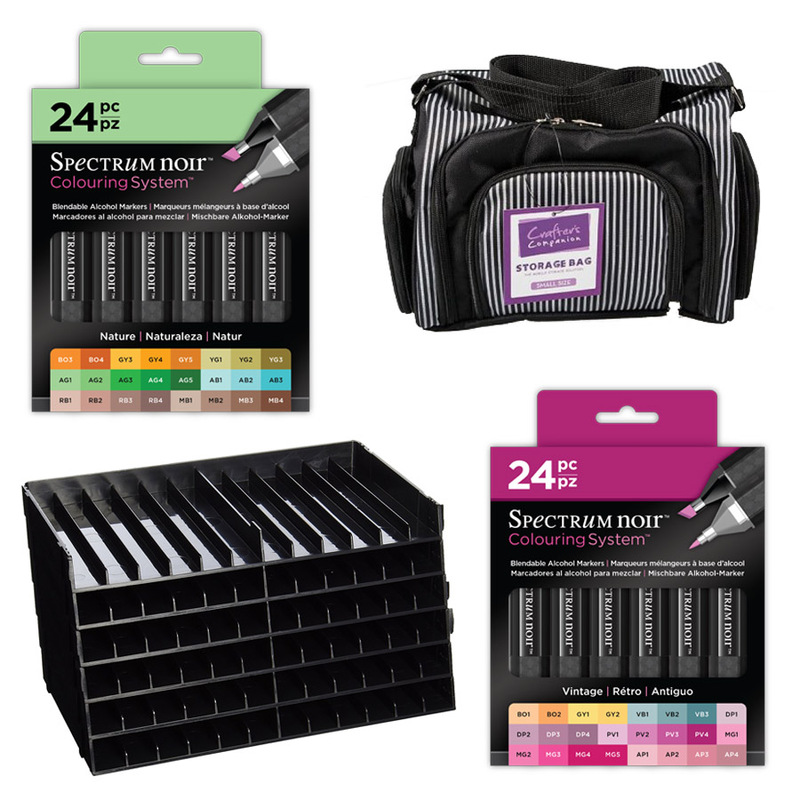 WIN a collection of Spectrum Noir markers! For a chance to win, simply LIKE and SHARE this Facebook post. The deadline for entries is 12pm on Friday 21st July 2017. Best of luck! Have recently treated myself to 6 boxes of 12 SPECTRUM NOIR pens, I’m so so happy with them it’s untrue. ( I can’t stop talking about them) can anyone tell me though, used on a semi permanent basis, how long roughly do the pens last please? I’m now saving my pennies to buy the Spectrum Noìr Glitter Pens and can hardly wait. Thankyou Cowling & Wilcox for a fab write up on them. The length of time these pens will last depends on how often they’re used and how they’re stored. We recommend you keep your Spectrum Noir pens stored flat and in a cool place. With regular use, say a couple of times a months, these pens can last up to four or five years – again, it depends on how they’re stored when you’re not using them. It does vary from user to user, as with ProMarkers. Hope that helps!